How to go to Ayvalik? What to eat in Ayvalik? Where to go in Ayvalik? 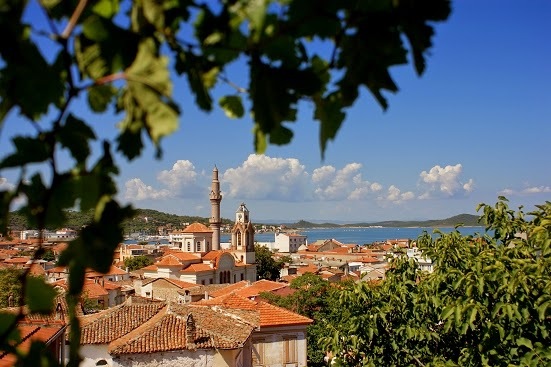 What to do in Ayvalik? What to buy in Ayvalik? From yellow to orange, from orange to cyclamen, where the mother nature shows her magic on every sunset... A place called Moshinos by the Greeks before the establishment of the Turkish Republic, which means "Fragrant Island"... The "Alibey Island" or "Cunda Island" of present day Embraces those, who want to achieve bodily as well as mental inertia and to enjoy sea in the summer or a little relaxing escape from the city in the winter... With oriel windowed houses, rough cobblestone pavements and quite narrow streets, where Greek, Cretan and Turkish can be heard simultaneously, the Cunda Island awaits his visitors to fascinate with its spirit reflecting the common culture of Aegean... WHILE YOU ARE IN CUNDA ISLAND, WE SAY "DON'T LEAVE CUNDA" Without hiring a small boat and enjoying the bays Without swimming in Patricia' natural bays which you can arrive by following the road on the old mill and passing through the olive plants. Without drinking water which is believed healing from the old fountain Without spending a day in the pine smelling camping area Without watching the sunset in the Lovers' Hill Without tasting a breakfast in the "Taş Kahve" early in the morning Without setting free the rover inside you in the norrow streets visiting the churchs which reflect the history of the island Without making some little trips to nearby places like Çandarlı, Ören, Burhaniye and Asos Without tasting the location specific meals prepared with special Aegean herbs and delicious olive oil. Ayvalik is an old sea side town situated on the North-western Aegean coast of turkey, approximately 160 km North of Izmir, and 355 km South of Istanbul; originally inhabited by the Greeks until the mid 1920's, it still has the characteristics of an old Greek town, with wonderful Ottoman Greek houses and old churches visible throughout. The town is located on a coastal bay, where you can gaze across the Aegean Sea to the Greek Island of Mytilini, or alternatively view the nearby Island of Alibey (also known as Cunda) which has the riches of empty beaches, olive and pine trees and ancient monasteries scattered on the hill tops. Ayvalik has a labyrinth of narrow cobbled streets that are tributaries leading down to the busy market area and harbour front, where you can spend your day perusing through the wonderful variety of shops, or just relax by the waterside watching the fishing boats come and go; alternatively take the ferry boat across to Alibey to visit the restaurants and tavernas. The surrounding hillside is laden with groves of Olive trees, which are famous for producing much of Turkey's highly appreciated quality olive oil; also the hills accommodate copious amounts of pine trees that assist in Ayvalik boasting some of the best levels of air quality within Turkey with it's high levels of oxygen. A well-known beauty spot is locally known as "Devil's Table", where the views are spectacular and it is a must to witness the stunning sunset at the end of the day. Near to the town are two fabulous sandy beaches, Altinova and Sarimsakli, which are easily accessible by the local bus service (Dolmus), taxi or car; the beaches are un-crowded and teems of fish are visible through the crystal clear water. Ayvalik has gained the reputation of being one of Turkey's best locations for scuba diving, and you can also take boat trips from the harbour that will deliver you to various bays throughout the day to take a dip to cool off during your trip. Nightlife in Ayvalik is of a relaxed atmosphere, where you can frequent the many waterside open-air restaurants, bars and tavernas or simply stroll along the harbour front absorbing the idyllic atmosphere.